One of the best parts about living in the south is how much our little corner of the world has grown in the past few years. Awesome new restaurants and stores are popping up left and right and it makes me happy to be able to support local southern businesses. Rich Girl Rags, an adorable boutique based out of Charleston, just celebrated their first birthday and after a recent visit to their store I've fallen in love! It's so great to see a business that specifically caters to the stylish, young southern lady. I was able to tag along on to a RGR photo-shoot last week (my Godsister - girl in the navy/white maxi dress below- models for them) and had a blast! The RGR ladies are beyond nice and pretty much embody the definition of 'hustle'. So inspiring! 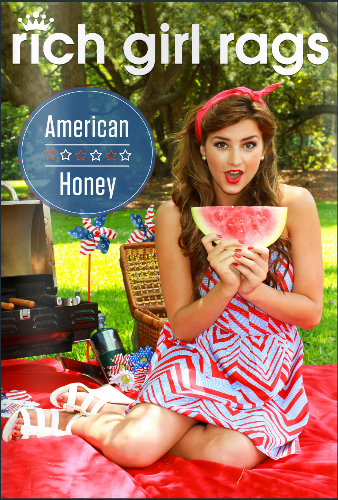 Their "American Honey" 4th of July themed look-book just went live on Tuesday and I am so obsessed! I love the use of red white and blue items, and that it was shot at a gorgeous location downtown Charleston. Go check it out, here!